What a year BMW is having. Earlier, the refreshed 2011 BMW Three Series models were unveiled, and now comes the piece de resistance: the highy acclaimed2011 BMW 5 Series. Completely new from stem to stern, this one is a bit larger than its predecesssor, and it contains more than a hint of the BMW 7 Seies i its design. The new 6th generation BMW 5 Series Sedan is already on BMW showroom floors across the country. "With the longest wheelbase in the class, a long and sleek hood, short overhangs, and a coupe-like roofline, the new BMW 5 Series Sedan stands out clearly from the competition. Overall, the aesthetic looks of the car are achieved through balanced proportions," a news release says." Design features emblematic of BMW are to be found at the front with its kidney grille inclined slightly forward, in the stylish and elegant side view of the car, and at the muscular rear end." BMW’s new Brake Energy Regeneration system is now installed on the Five series, a step that the company says saves energy and gasoline and reduces the vehicle’s fuel consumption over time. BMW has also provided an alternator system that runs only when its needed when the car is decelerating or braking. 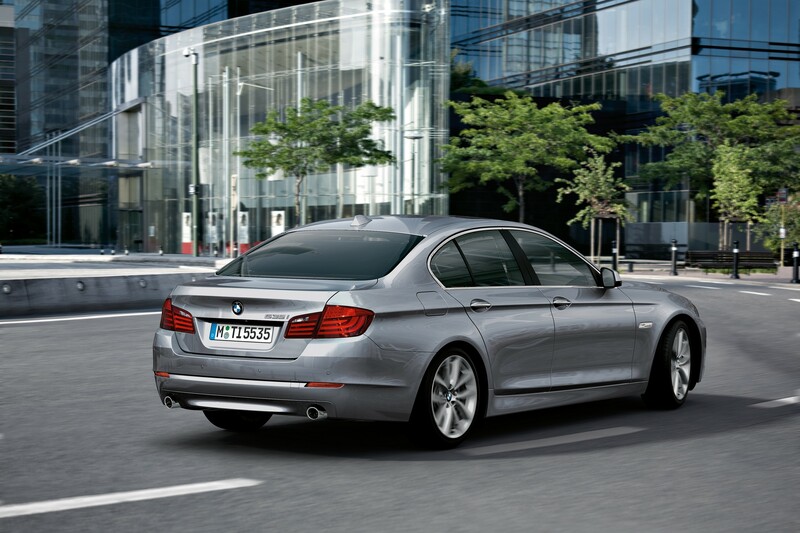 The new 5 Series will be offered in the United States with a choice of three gasoline engines. At its introduction, the new 5 Series will be available as a 535i and 550i. 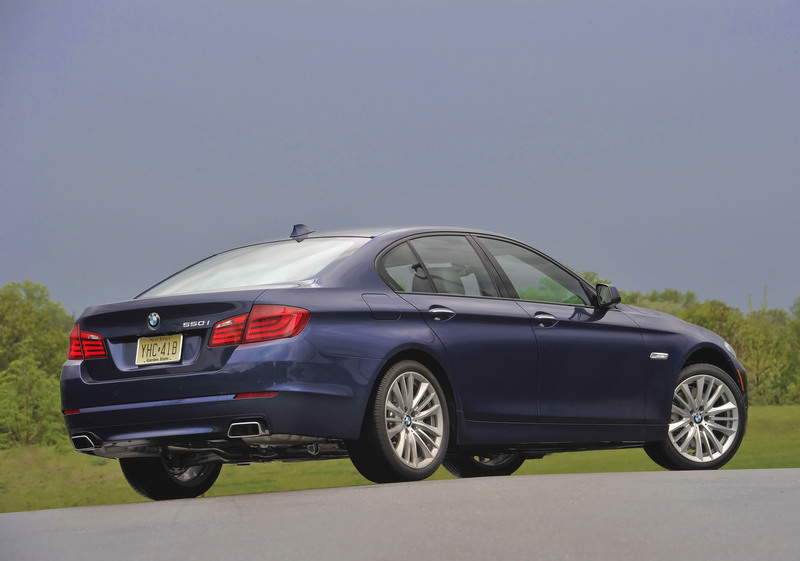 The 528i and xDrive all-wheel drive variants of all three models will arrive later in the year. The 550i is powered by BMW’s 4.4-liter, 400-hp twin turbocharged V-8 engine. Compared to BMW’s earlier, normally aspirated V-8, displacement is reduced from 4.8 to 4.4 liters, and incorporates twin turbochargers with High Precision direct injection. The new engine delivers its 400 hp over a range from 5500 to 6400 rpm. Maximum torque is 450 lb-ft, available over the extremely broad range of 1800 to 4500 rpm. You can reach sixty in 5.0 seconds. In addition to High Precision direct injection, the new engine is the first BMW inline-6 to be equipped with both turbocharging and BMW’s Valvetronic throttle-less intake technology. The combination of these BMW EfficientDynamics technologies delivers improved throttle response from idle to redline, reduced fuel consumption, and substantially reduced emissions. The new engine is rated at 300 hp at 5800 rpm and 300 lb-ft of torque. The torque peak is notable for its incredible accessibility: the full 300 lb-ft is available from 1200 rpm – 5000 rpm. Later, the BMW 528i will debut with a 240 hp inline-6 featuring lightweight magnesium-aluminum construction and Valvetronic throttle-less intake technology for efficiency and unparalleled responsiveness. The entire instrument cluster is in a high-resolution Black Panel display, in which four classic circular instruments are most prominent; other driving-relevant displays and readouts – including Navigation if present, vehicle-monitoring functions, upcoming service requirements and other information – also appear here in their various (and function-related) graphic forms. Climate-control settings and controls are located in a second Black Panel display in the center console stack. The center console comes in two variants: On cars with a manual gearbox the console is split into two sections, the black surface surrounding the gearshift lever and the buttons on the optional Driving Dynamics Control oriented towards the driver. A key holder has been placed between the gearshift lever and the climate controls. Prices for the new Five Series have not yet been announced. As if a new, stunning Five series isi't enough, BMW also has freshened models, the BMW Three Series. 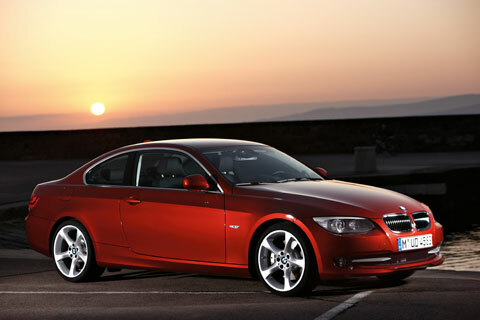 The models involved include the 2011 3 Series Coupe and Convertible, style changes for the 328i and 335i models and a new engine for 335i models. 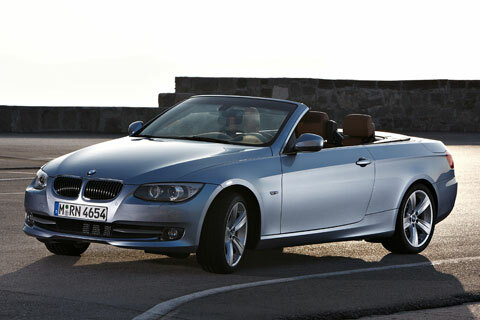 The 2011 3 Series Coupe and Convertible models went on sale this spring. The good news is that what makes these cars marvels of driving pleasure are not changed, according to BMW, so you’ll still get a perfectly balanced performance car with near equal weight distribution, quick, responsive steering, and strong acceleration. But what is changed are improvements which are in keeping with BMW’s apparent philosophy of improvements where needed and refinements where necessary. First, the 335i series gets an all new, 300 horsepower, 3.0 liter turbocharged all-aluminum engine that BMW says is more responsive, but also better on gas mileage. The 335i has already become legendary for explosive acceleration, so it will be interesting for the Automobile Journal staff to experience the newest power plant. The new engine is the first BMW inline-6 to combine turbocharging, High Precision direct fuel injection, and Valvetronic variable intake technology. Both a six speed manual gearbox and the six speed Steptronic automatic will be available, and the automatic has different shift paddles than before; this version uses pull-style paddles on the steering wheel. Styling changes can best be described as evolutionary in nature, with new headlights and taillights, and on the coupe and convertible, exterior mirrors that are specially designed for that pair. The hood has been revised, front and rear overhang have been extended somewhat, and there has also been some refinement to character lines on the flanks of the cars. The trademark kidney grille has been widened, with a chrome band “precisely twisted within itself,” as BMW says. Around back, BMW says, “The new design of the taillights is unique to the 3 Series Coupe and Convertible. The rear light cluster feature two-piece L-shapes and are further accentuated by a new color scheme. With two rows of light tubes that illuminate simultaneously, they create a night design with depth and dimension. Integrated flush into the body of the car, the lights are split into two sections and extend up the trunk lid, blending with the character lines from the side profile. Horizontal LED tube taillights give the car an unmistakable look at night. The horizontal flowing lines accentuate the wide track and low stance of the Coupe and Convertible.” Another new exterior design feature is “an additional horizontal contour line added to the rear air dam to further accentuate the width of the Coupe and Convertible. It creates light-and-shade effects to give the entire rear end a flatter and smoother appearance.” There are some new colors for the 3 Series Coupe and Convertible as well: Deep Sea Blue Metallic, Vermillion Red Metallic, and Mineral White Metallic.